Diverse food, city culture, storytelling, street art, and a little exercise - this tasting tour on foot offers a great mix for the curious urban adventurer. On this North City neighborhood experience, you will follow Montreal's most important street over 3 hours and cross 3 neighborhoods to learn all about the diverse cultural communities that inhabit them, sample classic food & drink that are symbolic to their identity here in Montreal, all while hearing stories about mom & pop shop owners, and spotting ever-evolving street art & murals along the way. 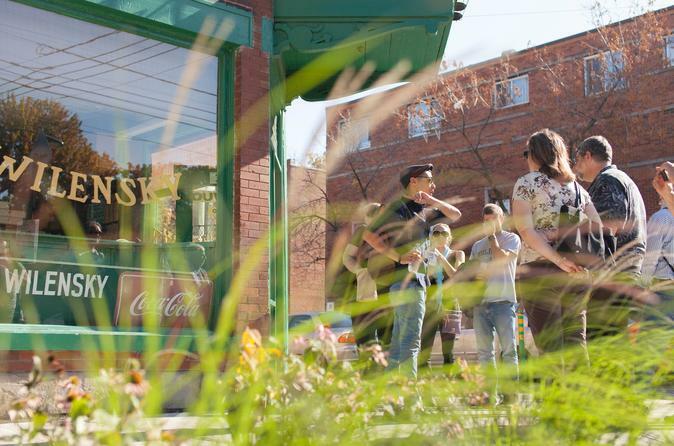 This tour is not about on-trend restaurants and famous chefs; rather it is a lens into the everyday life of Montrealers and the small shops and markets that help form the identity of the neighborhoods where they live. Like New York's Lower East Side, for three centuries immigrants to Montreal have settled along the city’s main boulevard, known interchangeably as St. Lawrence, St.Laurent, or “The Main.” French, British, Chinese, Eastern European, Italian, Portuguese, Spanish, Latin American and North African – all have found their time and place on this historic street. Today, in lively shops, cafes and market stands, they continue to share their culinary heritage. This action-packed tasting tour - deemed a ‘Canadian Signature Experience’ by the Canadian Tourism Commission - tells the story of the arrival of these groups of immigrants, their roots, and the communities they formed in Montreal. You'll learn about the traditional foods and recipes they brought with them to Canada, and others that were created here in Quebec crossing cultures. We visits landmarks, ethnic grocers, delis, specialty shops, lunch counters, restaurants, cafes, and marketplaces, many of the mom & pop variety in business for between 50-100 years, all with their own unique stories that will be recounted by your guide. Of course, the best way to learn is to taste! This North City tour starts in the Plateau and makes its first stop in Little Portugal at a traditional Portuguese bakery for a classic 'pastéis de nata', egg tart pastry. The next two stops celebrate the Jewish history of the diverse Mile-End neighborhood by first visiting Wilensky's deli (in business since 1932 and barely changed inside!) for their famous Wilensky's Special sandwich, and next to 1950's founded St Viateur Bagel for a hot-from-the-oven Montreal bagel, a must do on every Montreal visit. After walking a typical Mile-End back lane-way to spot some street art & murals, you then hop on the city bus for a short ride into Little Italy. There you will track down some more classics: an espresso at the bar of Caffé Italia (another 1950's founded business) among the local Italians chatting away, and match it with a delicious cannoli from Passticeria Alati-Caserta, a neighborhood gem around since 1968. It's not over yet! The last stop is a climactic finish at the Jean-Talon Market, where you will taste the best of Quebec’s ‘cuisine du terroir’ with two locally produced Quebec cheeses and ice-cider). Here at Jean Talon - North America’s largest open-air market- is where you'll part ways from your guide with plenty left to explore - you will be full from the tour but temped to keep eating!